one of the real-time collaborative editors (etherpad) on shared media: several users can co-author one text in real-time. you can access this document from your own browser here http://doc.etherpad.org/XHxjBnuRow and add text to it. while our database and the various possibilities to add to it (via sending IMs to an avatar or via web page, maybe also by talking to a cube) are pretty much ready now, i think that we should reconsider the idea of using collaborative editing, which had been suggested earlier (actually, i think i saw it first in te facebook group). the etherpad used above can be run on any web server (it’s open source) and can be customized. a combination of these approaches would be possible: several authors could work on a document (chapter), and once it is finished, it could be sent to the LPDT2 server. 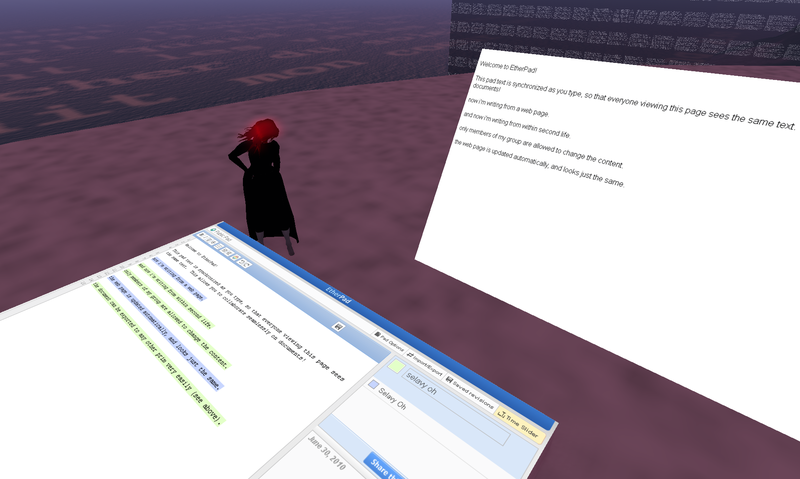 i also tried to retrieve the document from another prim as html, and that works quite well (see document on the right), so inworld display (also via our letter generators) would be easily possible, as long as the text doesn’t exceed the internal limits of second life’s html functions.